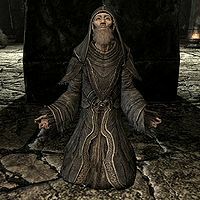 Wulfgar, an elderly priest, is one of the reclusive Greybeards living at the monastery at High Hrothgar, and one of your initial tutors in the Way of the Voice. Wulfgar will react when interacted with, greeting you with a muttered "Dovahkiin" and causing the surroundings to rumble in doing so. He wears a set of Greybeard's robes with the matching hood and boots. He carries a wooden bowl, a knife and a fork, a quill, a roll of paper, a nirnroot, a potato, a venison chop, a jar of honey, a goat cheese wedge, and a piece of bread. Wulfgar knows the following shouts: Disarm, Dismay, Elemental Fury, Fire Breath, Frost Breath, Ice Form, Unrelenting Force, and Whirlwind Sprint. Wulfgar is one of only two NPCs in Skyrim that are level 100, the other NPC being the Greybeard Borri. This page was last modified on 19 March 2016, at 21:11.